Those hot mornings are now softly turning into misty dewy mornings. Moist morning transport me back to home, Assam India. Indian festival season just started there. Festivity unfolds food, flavor and fashion. I reminisce about those beautiful days of school holidays, relishing festive food, buying and feeling the touch of crisp new clothes. Well, the last couple of years my friend initiated celebrating Ganesh Chaturthi. She meticulously plans and creates festivity with so much care and creativity. It is a 11 days affair. Even though I want to visit every day, my kids and work just occupy me and I could only manage to visit a few days. During the visits, I enjoy dressing up for the festivity. This year I see how linen became vogue in summer. 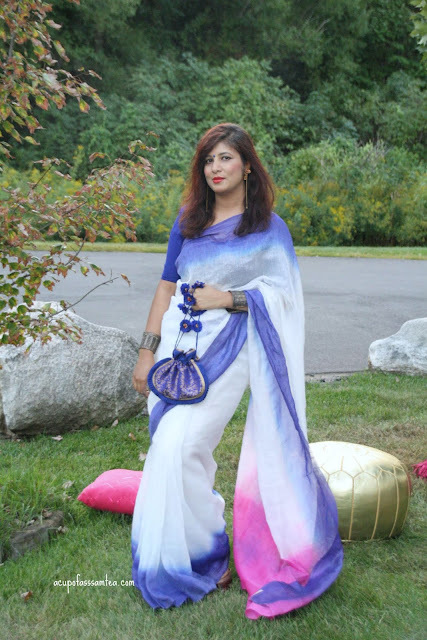 I chose this linen white saree with a blue border and a pink achal (the top end) which played a pinch of pop of color which you need for a festival look. I team it up with Assamese thuria and blue potli bag and a thick traditional Assamese Bengals called gam kharu. The saree almost felt like second skin to me, feathery and soft. Some people might find it little shuttle for Indian festive affair. Everything (accessories) has a gold tint to it. Initially I thought of silver tint then later decided on the gold, as it will add up some unexpected flair to it. Hope you like this look. Have a great weekend guys and enjoy the festive season. I love your saree, the choice of accessories, your makeup - basically everything about your festive look ! great sareee.... and the accessories are just so fit with it. You looks so elegant in your saree. So this is how to dress properly to go to Indian festival. I really appreciate it! Beautiful girl! Keep rockin' it. I love seeing how fashion is portrayed in all the different cultures across the globe. Very inspiring! This is so lovely. i love how fabulous you are wearing your outfit and the accessories and is just an amazing one. The purple, pink, and white work so well together! Love the whole outfit! The love the color of your saree. I find them so elegant. I love the color of your saree. You look so elegant in this white and blue combination. I would try something like this during Puja. These colors are absolutely to die for on you! What a great look for a fun event! I'm sure it will turn heads! That dress is so pretty. I would love attending this event just to see all the pretty dresses. I miss wearing saree may be this year I will. You look very elegant in it. The print is great. Wow this is absolutely beautiful those colours just go absolutely gorgeously together what a great festival look. I love your saree! This whole look is beautiful! The colors are absolutely beautiful. It reminds me of watercolor. You look great! Your dress is stunning, I love how the colors blend into each other. The 11 days festival sounds very fun as well. You are absolutely stunning! Amazing colors, such a beautiful s saree! I absolutely love your saree. You look so beautiful and the colors you chose are amazing!! 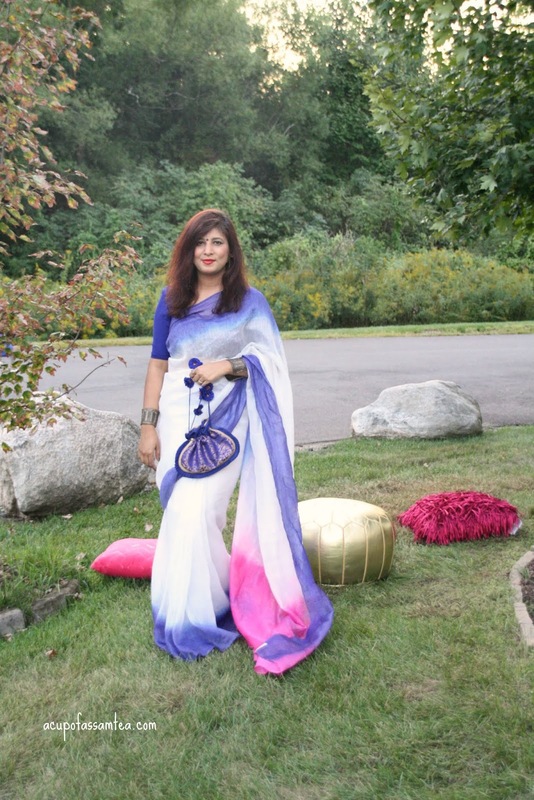 Those are so beautiful and amazing colors in that saree. I think you look gorgeous. I can imagine it would be a great fall outfit. This look is so very adorable. I love the festival look so much! 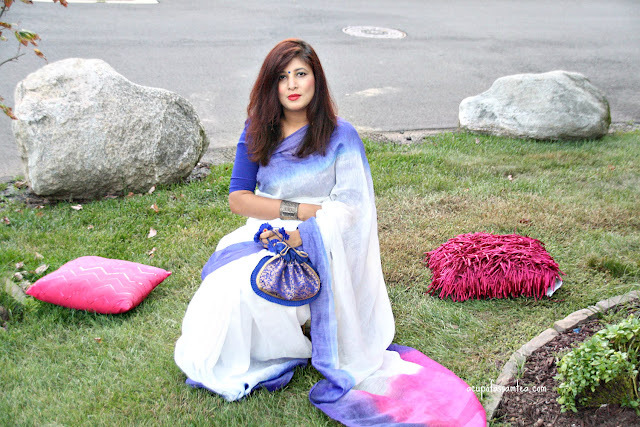 Your saree is absolutely beautiful. I love all of the colors. What a beautiful saree! I love those colors together- you looked beautiful. This is so pretty! I love the colors! You look great! Your outfit looks great, idk if I could an 11 day festival either but im sure it would fun. I love the saree and the way you are carrying it. Looks so refreshing and goes well with the background. You look amazing 😍 love your festival outfit!